Last month I talked a bit about kids' involvement in the big cocktail party of pop-culture. 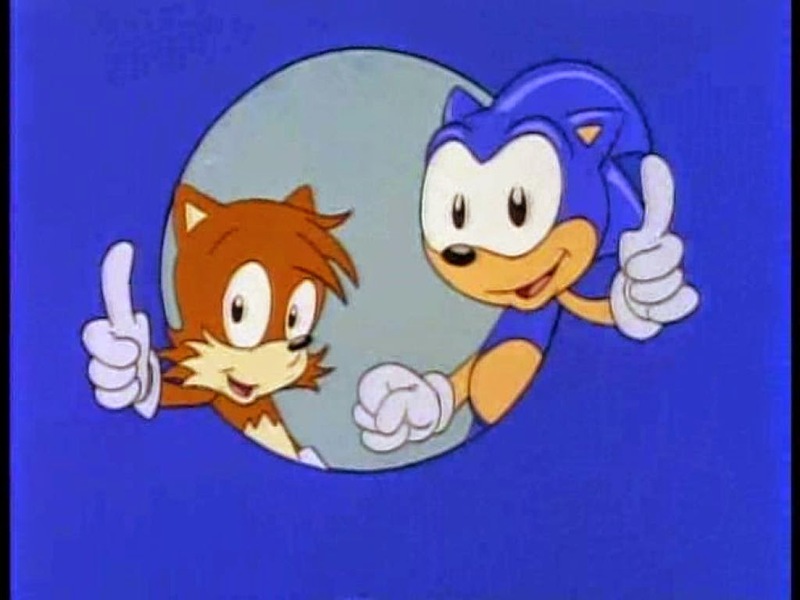 So, for this month, I decided I would review one of the chats around the hors d'oeuvre table I was involved in as a kid, namely, The Adventures of Sonic the Hedgehog. Thanks to YouTube, I was able to find the first two episodes of this beloved childhood memory and watch them again, this time not as a child playing Sonic 2 on the family television on Saturday afternoon, but as an adult who was glad to get a copy of Sonic Spinball for Christmas. In case you are unaware, Sonic the Hedgehog is a blue, spiky headed human being (in the sense of a union of body and soul; he talks, he has feelings, free will, etc.) who bears a very passing resemblance to a spiny mammal of the subfamily Erinaceinae. He first appeared in a video game for the Sega Genesis in which he ran very fast and attempted to save woodland animals from a maniacal scientist named Dr. Robotnik, who seemed to be using these animals as the central processing unites for his army of robots, which looked like other animals. It's the TV show we're here to discuss, however, and at first the show seems pretty straight forward. The cynical view is that this was a pretty shameless cash-grab along the lines of Transformers, Care Bears, G.I. Joe, Teenage Mutant Ninja Turtles, and Mighty Max (the last two were airing around the same time as Sonic). They were shows that got kids excited about toys and games, so they would get their parents to buy those toys and games. A further bit of evidence in favor of this bitter, pessimistic theory1 is that the show seems to be largely a rip-off of Bugs Bunny Loony Toons (Sonic even sounds a bit like Bugs) with some heavy handed moralizing thrown in. (Bugs Bunny did not concern himself with morals. Bugs Bunny may be a sociopath). Ok, so there's the cynical view, and it's worth considering, but tuck it away for further consideration on your own because we're moving on! This show has several interesting features. First, it's as abstract as a dream. The locations are almost Dali-esque (I'm reminded of Ren and Stimpy), and they contain what gives the barest sense of context, or is directly related to something that Sonic intends to do or has to deal with. The things in these locations are also merely props that either have symbolic meaning, or manifest the intention of one of the characters. Things will even appear out of nowhere for this purpose. Secondly, the character of Sonic is the central (and almost only) thing to focus on in the show. Everything orbits around him. Everything is there for him to use, for him to act upon, for him to respond to. If a thing doesn't serve this purpose, it isn't there. And what is Sonic's character? He isn't just a short, blue Bugs Bunny. The qualities he shares with Bugs are bravado, cleverness, and competence. He's forever getting ahead of and outsmarting his enemies. But, the qualities that set him apart are his childishness and vulnerability. Sonic outwits his enemies, but he does it with a little kid's “Look at me mom!” attitude. And occasionally, he gets scared. I suspect this is why I pretended to be Sonic the Hedgehog, but I didn't pretend to be Bugs Bunny. 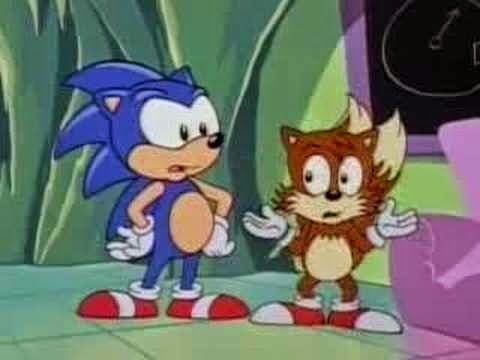 The writers of The Adventures of Sonic the Hedgehog made a character that a certain group of kids could relate to, but that also had characteristics those same kids wished they had and aspired to. It's interesting to reflect on how much this was intensified by the fact that Sonic was a character in a video game, so that the kids who pretended to be Sonic while running around outside with their friends could then go inside and control how he ran and jumped and defeated the evil Robotnik on the same TV screen where he'd seen Sonic doing the same things that Saturday morning. Even the “PSAs” at the end of each episode (called “Sonic Says”) contribute to this desire to emulate this character. The little morals at the end of Saturday morning cartoons have become a kind of joke (“Wheel of morality turn, turn, turn. Tell us the lesson that we should learn.”) But, if you think about it, it was in these ending bits that Sonic told you, the kid watching the show, the kid who wanted to be him, how you could be like him. Sonic wouldn't call 911 unless it was a real emergency. Sonic would share his lunch so that everyone could have a better time. So, I'll act that way. 1 Not that this means I think the bitter pessimists are wrong about the cash-grabbing mind you. 2 Like when Sonic decives his pursuers into running off a cliff. I might have been a little too enamored of that idea.